[PDF] European Consensus and the Legitimacy of the European Court of Human Rights | Free eBooks Download - EBOOKEE! Description: In order to be effective, international tribunals should be perceived as legitimate adjudicators. European Consensus and the Legitimacy of the European Court of Human Rights provides in-depth analyses on whether European consensus is capable of enhancing the legitimacy of the European Court of Human Rights (ECtHR). Focusing on the method and value of European consensus, it examines the practicalities of consensus identification and application and discusses whether State-counting is appropriate in human rights adjudication. 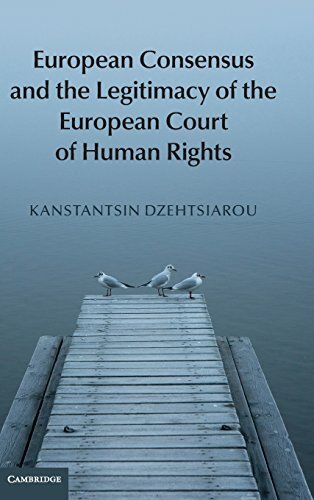 With over 30 interviews from judges of the ECtHR and qualitative analyses of the case law, this book gives readers access to firsthand and up-to-date information and provides an understanding of how the European Court of Human Rights in Strasbourg interprets the European Convention on Human Rights. No comments for "[PDF] European Consensus and the Legitimacy of the European Court of Human Rights".